This restaurant is named after a famous female Mexican painter, who was known for her self portraits. We didn't see any replicas of her paintings hanging in the restaurant, but then again we were there for the good food. 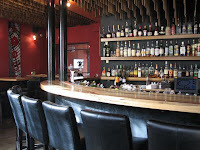 Go to this place on Friday-Saturday, 12:00-17:00, when they have their business menu. You get a starter, main dish and soft drink for the main dish price. We started with the our meal with the eggplants kadaif (a small threads pastry) and eggplants terrine appetizers. These dishes were quite good. 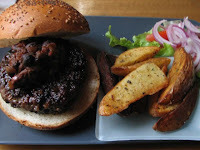 One of the main dishes that we liked was the chili con carne burger. 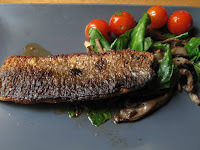 The other main dish that we tried, which was just OK, was a mullet fish on some cherry tomatoes. But the literally cherry on top was an amazing dessert: pistachio mousse with amarena cherries, vanilla and peach. This was wow, though we had some disputes over the necessity of the cherries. Frida Kahlo is next to the intersection of Allenby st. with Lilenblum. You can go south on Allenby until you hit the crossroad, and then take right.